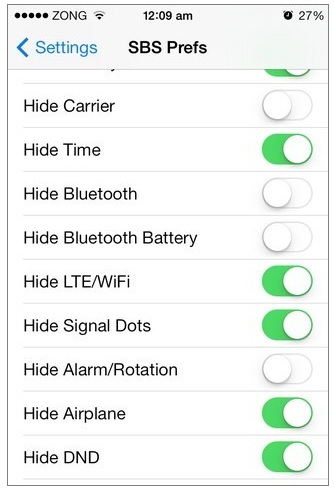 There are wonderful tweaks available for dealing with multiple aspects of iOS such as Hideme7. There is always scope of improvement in jailbreak store. Although, Hideme7 is a valuable tool for customizing iOS 7 status bars, yet you cannot consider its feature list exhaustive by any sort of imagination. If you want to hide the status bar altogether, Hideme7 will not be helpful to you. Another great hiding tweak called StatusBarSuite has been introduced that will provide more options for making items on status bar invisible. It lets you deal with both temporary and permanent elements of status bar. Users can hide Wi-Fi and battery icons conveniently, time display and other things on the display as well. Some type of indicators or icons is available only when you have enabled a certain setting or you are using a certain service. With the aid of StatusBarSuite you can keep these icons invisible even when you are using those settings. It adds its own menu to the app of Settings (Settings/SBS Preferences), where you will find a separate option for toggle for each icon. The components that can be removed from the status bar are following. In order to hide the particular element, the toggle must be turned off instead of ‘on’. The changes made through StatusBarSuite don’t become active until you restart the device for which the option is available at the bottom of the Setting menu of the tweak. Another unique but buggy quality of StatusBarSuite is toggle option for ‘Hide Status Bar’. When you switch on this option, all the apps will become full screen. Unfortunately, this activity might lead to some crashes and problems with apps meant for displaying a keyboard. In our experience, the problems are small but not to be ignored in any case. StatusBarSuite is a free app unlike Hideme7 that costs 99 cents. You can conveniently download it from the BigBoss repo of the Cydia store.